Recounting his three years in Korea, the highest-ranking non-Korean executive at Hyundai sheds light on a business culture very few Western journalists ever experience in this revealing, moving, and hilarious memoir. When Frank Ahrens, a middle-aged bachelor and eighteen-year veteran at the Washington Post, fell in love with a diplomat, his life changed dramatically. 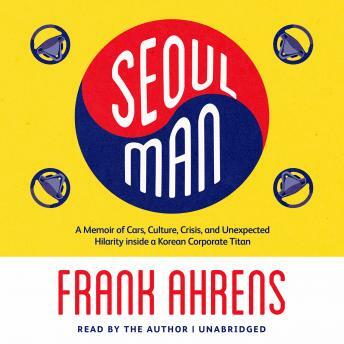 Following his new bride to her first appointment in Seoul, South Korea, Frank traded the newsroom for a corporate suite, becoming director of global communications at Hyundai Motors. In a land whose population is ninety-seven percent Korean, he was one of fewer than ten non-Koreans in a company of 5,000 employees. For the next three years, Frank traveled to auto shows and press conferences around the world, pitching Hyundai to former colleagues while trying to navigate cultural differences at home and at work. While his appreciation for absurdity enabled him to laugh his way through many awkward encounters, his job began to take a toll on his marriage and family. Eventually, he became a vice president-the highest-ranking non-Korean in the history of Hyundai-but at an untenable price.